The inspiration for this came from finding a round disk with 12 holes in it. It was originally from a ceiling light fixture. 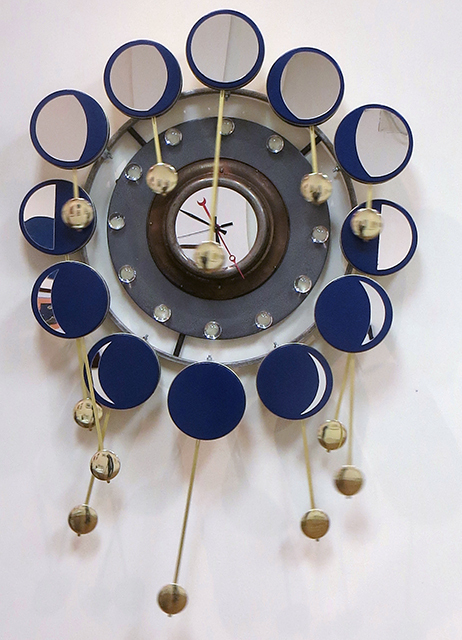 It first I was just going to use it as a clock but as the piece grew I ran into an image of the lunar cycle using 12 photos and decided on that direction for the clock. I have a lot of tins but I did not have 12 the same size and I really wanted a consistent size. After scouring the local thrift shops and walking around the neighborhood during recycling days and not finding what I wanted I started looking online and found a cheap cookie tin site. The blue was beautiful. It reminded me of early morning skies with the moon still out. The tins were also a perfect size for the pendulum units. I decided on the different lengths that went at different speeds to show the different energies throughout the day/month. From frantic to more relaxed. The plastic knobs are painted in the back with glow in the dark paint so in the dark you have a ring of moons.